James is a Winemaker Monday â Thursday, and a Fly-Fishing Guide and Instructor for Redâs Fly Shop Friday â Sunday. He is a father of a two sons, both of whom love to be on the water with their dad. His wife Colleen likes to be on the water with the family, but so far fly-fishing is an observational sport for her. Many of you might recognize James from working at Creekside Angling in Issaquah, WA before attending Central Washington University in Ellensburg, WA. He graduated with a B.S. in Biology and after working several years with Washington State Department of Fish and Wildlife as a Fisheries Technician, he did a 180 and attended Washington State University to pursue his M.S. degree in Viticulture and Enology. After WSU, James was able to re-locate to Yakima, WA, where he can pursue and enjoy all of his passions: Family, Fly-Fishing, and Wine. Not bad James, not bad. Well we sure have had some nice weather over the past couple of weeks. Daytime temps in the mid-60's, even up to 70 a couple days, and mild nighttime temps in the mid to upper 30's and sometimes not dipping below the 40's.Usually this time of year those temperature combinations = blown river. However, with our low snowpack this year, especially in the lower elevations, the river has been in remarkable shape. Yes, we have had some slight ups and downs in river flow, but overall the flows have stayed fairly consistent. In fact, it was so low their a couple weeks ago we welcomed the slight bump in river flows. The extra water creates more available habitat for the fish, and a little color in the water makes them more willing to rise to our dry flies. Before I get to the fishing report, I wanted to reiterate Joe's fish handling post from a few weeks ago, which you can read here. Working in agriculture in the Yakima Valley, and as a Fly Fishing Guide on the Yakima River, I am constantly looking at Snowpack levels this time of year, and right now we are well below our normal snowpack for the areas that feed the Yakima River. Yes, the Reservoirs up on Snoqualmie Pass are near 100% full, but as soon as those lakes start to feed the Yakima River in the irrigation season they will empty quickly, and there is not much snow to replace what we use. A drought has been issued by the Dept. of Ecology for the entire Yakima Basin, which you can read some FAQ's about here if you are interested. What this means for fisherman is that we can expect lower than normal flows during the summer months. A warm and dry summer is forecast for Washington, so with lower summer flows we will most likely see some pretty warm water temps on the Yakima River this summer. It is imperative that we all take as much care in handling our fish as possible. Yes, the water temps are nice and cool right now, but if we do not handle our fish with care now, they may be at a disadvantage going into the warmer months. We want to keep the fish as healthy as possible now so they are in excellent shape and in peak health when they head into the coming summer. Make sure to pinch those barbs and double check that you have pinched them completely. Try rolling the hook a little in your hemostats/pliers to really get that barb all the way mashed or completely broken off. 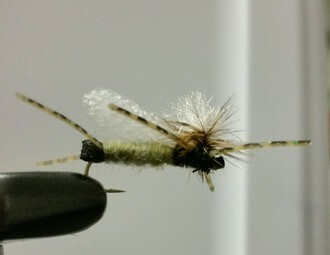 Some of the larger dry flies we fish right now are hard to get the barb completely mashed down. Keep the fish in the (rubber) net, pop the fly out as quickly as possible, and get 'em back in the water. Try not to handle the fish at all if possible. Let's all hope for some spring snow over the next few weeks. Rant over. The fishing has been good recently, with some days better than others. Not only are the fish still up on Skwala's, but on cloudy days we are seeing a fairly decent Baetis hatch. This past Saturday I also saw a few March Browns flying around in the lower canyon, so be ready for that hatch coming up in the within next couple weeks (especially up in the Farmlands). I found a bunch of Skwala Nymphs under rocks just at the rivers edge this past Saturday as well, along with quite a few adults floating on the water, so the Skwala fishing should remain strong for at least another week or two. If you are fishing on a bright, sunny day, focus your efforts on nymphs and streamers in the morning, and then switch over to dries as the sun dips behind the canyon walls revealing the shady banks. Stonefly nymph's (Pat's, 20-inchers, etc.) with a small nymph (Jig-head Pheasant Tail, Tungsten Ready Baetis, etc.) has been a good set up. On a cloudy day you can start with a dry-dropper set up and fish it all the way until dark. You might even try a double dry set up, with a Skwala dry as your lead fly, and a #16 or #18 Baetis dry as a trailing fly. In the right sections there have been fish up consistently feeding on Baetis, and more often than not they will eat a Skwala, but there are some picky guys as well that will only eat the Baetis. If the river does come up a bit on the day you are fishing, don't forget about San Juan Worms, and Streamers tend to work well in that situation also. We can never say enough on the the catching and handling of all WILD TROUT, Whitefish, on all Catch and Release waters. We should also consider the right weight rod, leader and tippet, to be able to land a fish in a timely manor.. Let's CATCH and RELEASE each WILD TROUT as if it's the TROUT on earth. You have a gem of a river and my first visit a few weeks ago left me wanting more. It was a nice weekend away from Vancouver Canada. Your trout are in great shape so I think it's safe to say that many people are looking after and handling the trout well. GREAT JOB!!! I was hoping to come out there and fish in the middle to late part a September. Sounds like I should rethink this due to low water and warmer water temperatures? I'm sure drifting will be out a the question what about wading?